My daughter had her senior portraits done last week and we are anxiously awaiting the user id and password from the photographer so we can actually see the gagillion picures she took. I received an email this morning listing 25 ways to tell if you are old. You know what? I read that damn list TWICE and every single one applied to me! I am pretty sure Virginia has the most oblivious drivers in all fo the US. I thought for sure whn you took driver's ed you learned that the left lane is the PASSING LANE. So if you are in THAT lane going slower than the people in the right lane, GET THE HELL OUT OF THE WAY! Sorry for yelling, but this is a huge pet peeve of mine! I really want a Blackberry Curve. I just got a new cell phone, but I wish I had gotten the Blackberry. I haven't quite figured out how I can talk The Salesman into buying me one since my phone is not even 6 months old. Any suggestions? It really bothers my husband and I spend so much time, effort and money on taking care of our lawn, only to have the neighbors spread their weeds in our yard. Use the weed whacker and bag your grass! You only have a postage stamp size lot for Heaven's sake. I love sommer, but I am ready for cooler weather and less humidity. I am pretty much over the HHH effect. Hazy. Hot. Humid. It would be nice to actually walk out the front door and not have my glasses fogged up immediately. Is it time for the Oyster Festival yet? 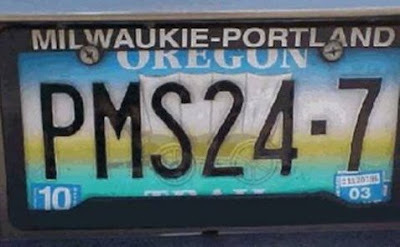 How's that for a vanity plate Mama? P.S. This picture was emailed to me and I have no idea where this picture came from so I can give no credit. After an extremely stressful week with The Salesman being away, I was extremely glad for the weekend to arrive. Saturday night was an amazing one spent with BHE, MPM and CBW (huh, lots of initials there). We spent a great evening stuffing our faces with eating piles of wonderful food and a few bottles sips of wine, and best of all, lots and lots of laughs! BHE’s plans to have dinner with Mental P after she dropped her lovely daughter off at UVA were intensified when she included both CBW and Bud and Cool Breeze, and myself of course, as a surprise to Mama. I sooo wish I'd had my camera in hand when I looked up and saw her face! SURPRISE = priceless!!!! It was so good to just relax with good friends, good food and good wine, even though I think there was some talk from the waiter about how we couldn’t have anymore wine? Sunday proved to be just as amazing because The Salesman finally arrived home after being gone almost the entire month of August. It is really, really good to have him home. I have some updates on my FIL, but for once I would like to end a post on a happier note, so I am going to leave those details for another day. I’m kind of angry with God right now. I don’t usually get mad at Him, but 2 grandparents in one summer is just not fair. My Father in law is not fairing well, and although we are still waiting on the results from all of the tests, the prognosis doesn’t look good. I am sad that my husband is ½ country away and is having to deal with all of this and I can’t be there to comfort him. I am sad that my children may have to deal with the death of another grandparent, even though they are not close. It is a two-fold thing. The loss of another, and the painful memory of the loss of the last. At the same time, I feel guilty. Life here is continuing, while life in Indiana/Chicago is suffering. We still go to work, go to practice, go out to dinner, live our lives. I feel guilty for being happy that my son has a new girlfriend that he seems to really like. I feel guilty for being ecstatic that my daughter made both varsity and competition cheerleading and is Captain on both teams. Finally. I feel guilty for being excited for school to start. For my daughter to start her senior year and for my son to start is junior one. I feel guilty for looking forward for good things to come this school year. I feel guilty for wishing my husband was home, instead of several states away when I know the right thing for him to do is to be with his mom and brothers right now. I feel guilty for not being there with him and his family as they make these life decisions, and I feel guilty that I am thankful I don’t have to make them. And I don’t know if I am wrong to feel all of these things, including the guilt. I feel as if things are spinning out of control, and there doesn’t seem to be a way to make the spinning stop. I just want time to slow down a little and let me catch my breath. Momx2 wanted me ahem, her personal assistant that you all wish you had to assure all of you she has NOT, I repeat NOT, dropped off the side of the Earth. Unfortunately, Momx2's family has been struck again by cancer. The Salesman's father has had bone cancer for quite sometime, and recently has taken a turn for the worst. A couple years ago, the doctors replace his pelvis and upper thigh bone with a titanium rod and within another year had to remove more of the bone in his leg and replace that as well. The type of tumor he has is called Chondrosarcoma and although can be treated, sort of, it is not uncommon for it to mestastasize in the lungs and lymph nodes. We are afraid that we have reached that stage. His lymph nodes are enlarged and they have found a few spots in his lungs. The x-rays and mri SEEM to indicate that the spots may only be blood clots and that perhaps the lymph nodes are as a result of the excruciating pain that he is currently in. We should have results for the 40gagillion tests they ran earlier this week on Wed or Thursday. We are just praying for something positive, whatever God decides that should be. The Salesman has only been home 2 days out of the last 2 weeks and is not due to return home again until next Sunday. Needless to say, Momx2 is quite stressed out. On a lighter note, CG has recently made both the Competition cheering and the Varsity cheering teams at school, and as team mom, Momx2 has been busy meeting with coaches, other parents etc. to try and get ready for the last year of cheering. So to all you bloggers out there, that might be missing Momx2, rest assured, she is still around. Although she is not sure when her blog became written by a personal assistant that she must be getting for free, because she dang sure ain't paying her. Momx2's personal assistant who, as previously stated, ain't gettin' paid! Oh no!! Should we look for her? Perhaps she has lapsed into another blog fog and just hasn’t had the energy to post. That sounds lame, but I have it on good authority that it is a possibility. Don’t worry, I bet she will turn up eventually. She would like to assure you she has been reading your posts, and although has only commented on a few, she really is paying attention. I heard that she has been super busy at work, and really lazy at home. I bet she’ll be back soon, I hear she has lots to talk about.